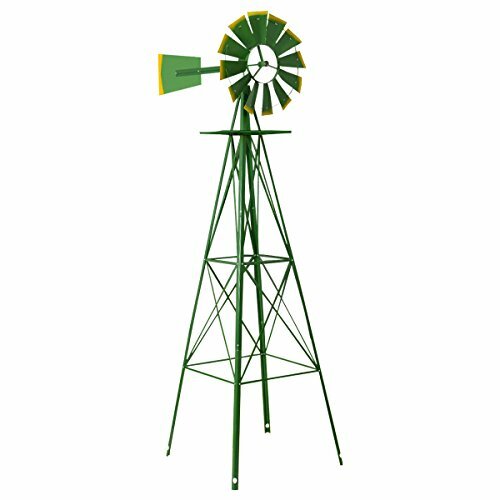 TANGKULA 8FT Windmill Yard Garden Metal Ornamental Wind Mill Weather Vane Weather Resistant (Green) by TANGKULA at Rodale Institute Store. MPN: Windmill. Hurry! Limited time offer. Offer valid only while supplies last. Description:This is our brandnew yard garden windmill, which holds a total cover of solid iron material,offering you a longtime using satisfaction. This is our brandnew yard garden windmill, which holds a total cover of solid iron material,offering you a longtime using satisfaction. This ornamental windmill measures bothwind speed and wind direction. The windmill uses a fully operational rotating wheelto give you an idea of how hard the wind is blowing, plus a top weather vane toindicate the direction of the breeze. Standing 8-Ft. tall, the heavy steel structureutilizes sealed roller to keep the 22in. dia. Wheel turning quietly and effortlessly.A durable gray powder-coat finish with red trimmed blades will keep this lawn favoritelooking great for years to come. Don't hesitate to buy it now! ☆DURABLE: With a total size of 26'' (L)*26'' (W)*96'' (H), it is constructed with solid iron material, which features weather resistance and rust-proof bringing you a durable and reliable using experience. ☆PERFORMANCE: This high quality windmill well assists you to predict both the direction and speed of wind. And the most laudable performance is to generate wind power as you need, which truly provides you a healthy and environmental friendliness lifestyle. ☆APPLICATION: It is widely applied in your yard or garden, which not only is a great windmill performing well without any noise, but also its bright color and trendy design make it a nice outdoor decoration for you. ☆INSTALLATION: You can set up this item quickly and easily according to a clear assemble instruction, which better solves your installation annoyance and enables you assemble a sturdy windmill in one second. ☆GUARANTEE: UPS or USPS will deliver the item to your house in 3-6 business days after you place an order. We packed this item as good as we can, if there is any damaged parts, please contact us freely and provide pictures of damaged parts for us to solve the problem as the way you want(discount or replacement).